Those who want to help others and get started on a career in health care can do just that with a degree or certificate in medical assisting. With the necessary education out of the way, a medical assistant can make a big difference in a hospital, clinic or physician’s office by helping with back-end office work or working directly with patients. To find the right program to meet your career aspirations, do some research. 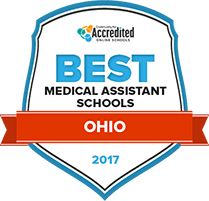 Our handy list of Ohio’s 2017 Top Schools for Medical Assisting is a good starting point. We looked at a number of factors, like class sizes and career placement, to develop this list and save you some time. Cincinnati State Technical and Community College's medical assisting certificate program is a health sciences technology training. At the end of the program, adults should know how to complete tasks such as scheduling patient appointments, preparing patients for physician exams and treatments and taking blood and measuring blood pressure levels. Courses in the 36 credit program include clinical procedures for medical assistants, human body in health and disease, lifespan development and medical office insurance coding and billing. An externship and medical assistant seminar take place during the third and final semester of the certificate program. Edison State Community College's medical assisting certificate program is delivered via a combination of in-person and online locations. The program is an entry level medical assistant career training program. Within the 32 credit program are classes like document processing, medical office procedures, computer concepts and applications and medical insurance and coding. To cap off the training, the college has included an internship and an internship seminar into the curriculum. Before adults enroll in the program they are encouraged to ensure that they can commit about one year of study to finish the training. Adults who graduate from the medical assisting program at Zane State College are eligible to take the national board test which, after passing, leads to a medical assistant certification. Admissions procedures start with submitting an online application. Two years are needed to graduate with the Associate of Applied Science in Medical Assisting degree. Among the course schedule are classes such as medical assisting clinical procedures, disease and the disease process and nutrition and diet therapy. Laboratory work covers topics like anatomy and physiology. Medical ethics, laws and a clinical practicum and seminar conclude the training. Six program outcomes are associated with the medical assisting training at Belmont College. Among these six outcomes is the ability to understand and apply physiology, anatomy, psychology and communications knowledge to deliver patient care. Skills to be competent while taking patient vital signs, prepare people for testing and interpret medical exam results are other outcomes. To complete classes on time, students are encouraged to follow the college's established class sequence. Before students deviate from the course sequence, they must meet with an academic advisor. There are 65 total credits in the curriculum, including classes on areas like human biology, allied health math, medical office practices. Clark State Community College's Associate of Applied Science in Medical Assisting degree is taught at the school's Beavercreek and Springfield locations. The curriculum covers topics like medical administrative office, medical terminology, medical office laboratory procedures and lifespan human growth and development. Some classes can be taken online. Part-time and weekend class schedules are available. Graduation requirements include 200 hours of supervised practice which takes place during the daytime. Students need a 2.0 GPA or higher to graduate. They also need liability insurance, a CPR certification and to pass a background investigation. The medical assisting degree at Terra State Community College prepares students for work in the field in settings such as ambulatory care facilities, clinical labs, dental and optometry offices, chiropractic offices, nursing homes, doctors offices, clinics and medical offices. Graduates will be prepared to sit for the American Medical Technologists Registered Medical Assistant exam. There are also three certificate options: medical scribe, medical assisting and phlebotomy. There are a variety of clubs and organizations on campus, as well as intramural sports and recreation activities. Students services include academic advising, career services and library services. Upon graduating from a Lorain County Community College's medical assisting program, students will be prepared for a wide range of duties in the field. They'll be qualified to perform administrative functions, as well as to take vital signs, assess and record medical histories, collect lab specimens and assist with procedures and examinations. There are several options, including a two-year degree with different specializations, as well as a one-year certificate program. Some students can get started while they're still in high school, and the college maintains learning partnerships with several universities. For students who want to complete their degree, credits are transferable to four-year institutions. Whether they choose to pursue the certificate program or the full associate of applied science degree, graduates of an Eastern Gateway Community College medical assisting program can enter the field right away. They'll be prepared to carry out administrative duties in the front office, and also to work with patients by arranging for X-rays or lab procedures while recording medical histories. Graduates will be qualified to prepare patients, assist physicians, conduct tests and perform EKGs. Those who complete the certificate program will be ready to sit for the Basic Certification Examination. The accelerated certificate program can be completed in as little as two years. The medical assisting program at Rhodes State College, which is accredited by the Commission on Accreditation of Allied Health Education Program, prepares students for the national certification examination, which is delivered by the Certifying Board of the American Association of Medical Assistants. Students at Rhodes have the benefit of academic advisors and access to the Academic Success Center, where they can receive help from qualified tutors. Tutoring services are also available online. There are a range of campus activities, which students will notified of via email, as well as career services, veterans assistance and disability services. Columbus State Community College offers several informative sessions for prospective students in the school's medical assisting program. As the first person many patients encounter, medical assistants must understand procedures involving both administrative and clinical duties, both of which are covered in the coursework. Upon completion, graduates will be qualified for entry-level positions in a range of environments. The program, which is accredited by the Commission on Accreditation of Allied Health Education Programs, has existed since 1996. Students can work toward the medical assisting certificate program, and then move on to the full medical assisting ATS degree. Ohio state law does not offer a specific definition for the term "medical assistant." It does, however, provide for the delegation of medical tasks by physicians to "unlicensed persons," a group that includes medical assistants in Ohio. Under Ohio Administrative Code Section 4731.23, an "unlicensed person" is defined as, " an individual who is not licensed or otherwise specifically authorized by the Revised Code to perform the delegated medical task." According to the State Medical Board of Ohio, there are no legal or specified standard training requirements for the education or training of medical assistants in the state. State certification to practice as a medical assistant in Ohio is not required. There are also no state licensure or registration requirements, but because many employers prefer to hire certified medical assistants, a certification could be an important step on the road to becoming a medical assistant in Ohio. American Association of Medical Assistants (AAMA) Certified Medical Assistant (CMA) Candidates must: graduate from an accredited medical assisting program; complete non-paying practicum; and pass the CMA exam. Continuing education for recertification required. American Medical Technologists (AMT) Medical Assistant (RMA) Candidates can choose from among four eligibility paths to qualify for exam, then must pass the RMA exam. Certification maintenance requires completion of continuing education requirement. National Association for Health Professionals (NAHP) Nationally Registered Certified Medical Assistant (NRCMA) Completion of accredited education program, approved military medical training or minimum two years of professional experience for eligibility and successful passing of the NRCMA exam. Continuing education for recertification required. National Center for Competency Testing (NCCT) Medical Assistant (NCMA)1 Candidates choose from four eligibility paths for eligibility and must pass the NCMA exam. Recertification with continuing education required. National Healthcareer Association (NHA) Certified Clinical Medical Assistant (CCMA)2 Eligibility requires a high school diploma or GED, plus completion of accredited training or military or other work experience and passing of the CCMA exam. Continuing education for recertification is required. Does Ohio's state codes provide any description or guidance regarding scope of practice for medical assistants? That the task is within that physician's authority. The appropriate level of supervision. That the person to whom the task will be delegated is competent to perform that task. That the task can be performed without requiring the exercise of judgment based on medical knowledge. That the task can safely be performed according to exact, unchanging directions. That the task can be performed without repeated medical assessments. That the task, if performed improperly, would not present life threatening consequences or the danger of immediate and serious harm to the patient. That on-site supervision by the physician is given to the medical assistant when delegating the administration of drugs, notwithstanding a number of limited exceptions. Are there tasks specifically prohibited from the practice of medical assistants in Ohio? Specifically authorized only to be performed by a physician. Not within the authority of the physician or is beyond his or her training, expertise, or normal course of practice. Beyond the unlicensed person's competence. Geographic location factors such as population play a major role in determining actual salary figures for specific occupations. The chart below offers a glimpse at how location influences salaries for medical assistants in Ohio. There are dozens of formal educational options for prospective Ohio medical assistants, each offering its own quality academic program designed to suit the unique needs of its students. Highlighted here are three different types of medical assisting schools in Ohio for comparison. Clark State operates on three campus locations in Ohio: Springfield, Beavercreek and Bellefontaine. The college has per semester enrollment of over 5000 students. Associate of Applied Science-Medical Assisting and Certificate in Medical Assisting. Students pursuing the associate degree complete all coursework required for the Certificate in Medical Assisting at the completion of their first year of study and may apply for the Certificate at that time. Stark is a public, two-year college offering associate degrees, certificates and professional development programs in over 230 majors. Associate of Applied Science Degree in Medical Assisting. The degree is designed to be completed in two years (including a summer semester) of full-time study and is available in both day time and night time tracks. Offered on Stark's campus in Canton. UNOH is a private four-year college with its campus in Lima offering certificate, associate, bachelor and master degree programs to a 4,500 student population. Associate of Applied Business in Medical Assistant Technology. This degree is designed to be completed in six quarters of full-time study. State code chapter concerning physicians that includes laws and regulations pertaining to the scope and practice of medical assistants in Ohio. The state affiliate of the AAMA. The OSSMA site provides information on the association's networking events and scholarship programs, a job board, blog and more. Excellent site for government information and statistics on the medical assisting profession. Includes descriptions of job duties, education and training qualifications, job outlook, and more.